Guess what???? It's time for another designer's choice challenge at The House That Stamps Built. The super talented and creative Joy Hadden is the Rock Star challenging us this week and she wants us to clean up all our left overs! That's it, her challenge is "left overs". Joy must know my craft table needed cleaning off...she had great timing on this one. I usually have a little baggy sitting on my craft table with all sorts of paper pieces, images left over, dies that I'd cut and didn't use....I'm sure you know what I mean. So for Joy's challenge, I was going through my bag of left overs and found some paper combinations I liked and this image I had stamped, cut and colored quite some time back. Within minutes, this card came together. Love it when that happens! The stamps used came from Pairings stamp set, #9304-L "Martini" and #9316-E "Cheers". 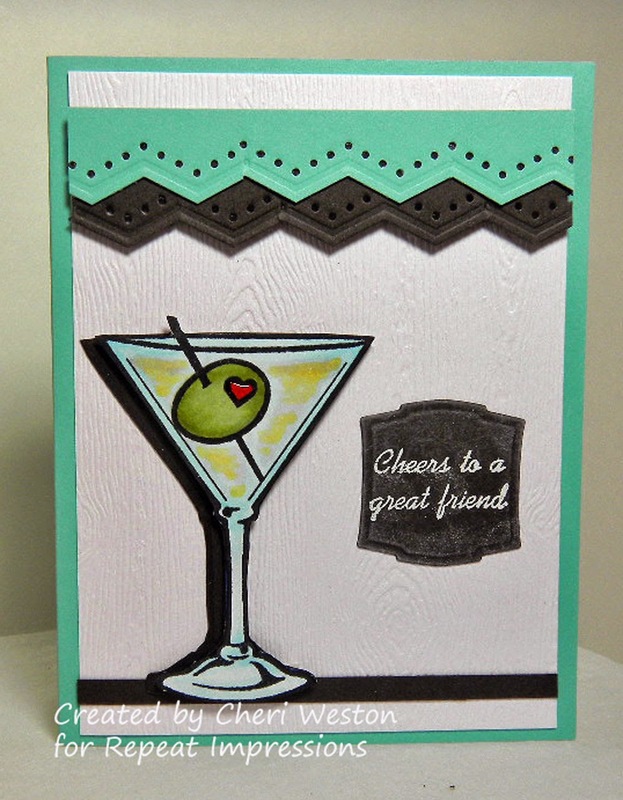 I traced the cut out image on a piece of left over black card stock to create a "shadow" effect for the martini and another strip o the same black cs leftover to give it a "table". I had just enough pieces left over to make the label and finish it off with some punched edges. For more "left over" inspiration, please check out the Rock Stars then come on over to The House and play along with us. You could win yourself some awesome RI stamps!